Important Information on Your Creditor List! First, you’ll get the most complete relief by including all your creditors. If a creditor is not included in your petition, there’s a chance that they can seek recourse later. Second, you’re not allowed to leave creditors off. If you have a credit card that is not maxed out and is current, you may want to hold it back, but that’s not allowed. You don’t want to be accused of inaccuracy on your bankruptcy petition that could cause your payment plan to be turned down (in a Chapter 13 bankruptcy) or your discharge to be disallowed (in a Chapter 7 bankruptcy). Third, having the most complete picture of your debt circumstances allows your bankruptcy attorney to get you the best results. By knowing exactly what your income versus debts are allows our attorneys to advise you whether you’re best served by a Chapter 7 or Chapter 13 and to ensure that the means test (the standard you must pass to secure a Chapter 7) is accurate and complete. How you can make sure your creditor list is complete Prior to coming in for your bankruptcy consultation, pull a free credit report to bring in with you. Also, collect up your last month of mail and sort through it for bills in case some of your past due debt isn’t on your credit report. Finally, sit down and think about your bills and see if there are any debts you can think of that aren’t on your credit report or in the stack of mail. This can include personal loans, furniture rentals (or rent to own arrangements), title pawns, payday loans and other “off the books” financial arrangements. Bring all this information along when you come in for your free consultation, along with your most recent tax returns and pay stubs. This will allow us to give you the best advice and tell you which options you’re eligible for and which will give you the most complete debt relief. Don’t be worried about being embarrassed by what you owe, whom you owe or what the debt was for – we’ve seen it all and can serve you best with accurate information. There’s no judgments in this process – we’re here to help you. Remember, any creditor you fail to list in your bankruptcy petition won’t be discharged and can come after you at any point. If you leave off a major debt, this can ruin your financial fresh start and you don’t want that. And, worse than your repayment plan not being approved or your petition being dismissed, you can be accused of bankruptcy fraud for leaving off debts and creditors. In short, your bankruptcy petition needs to be both accurate and complete. Here are some audio ads that we did for a local radio station! Did you know we represent Colorado Springs clients too?! 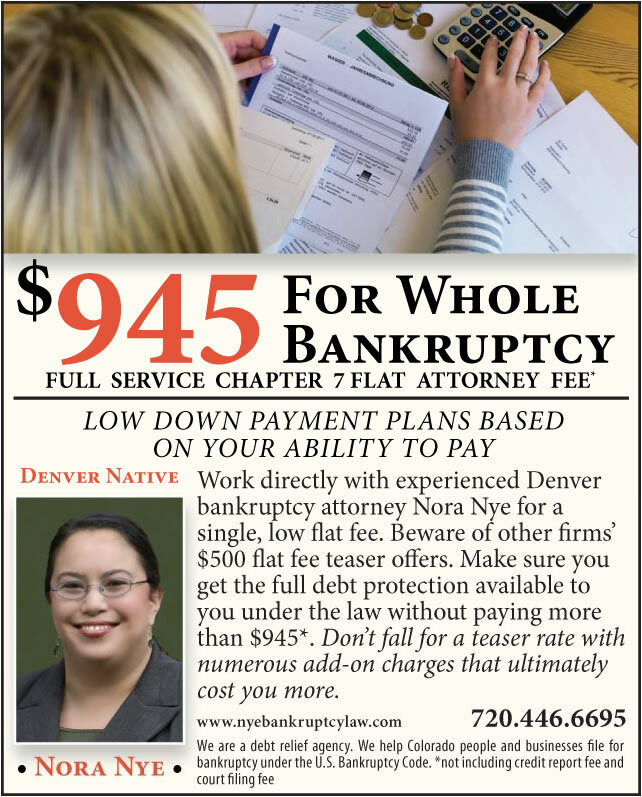 Yes, we do represent Colorado Springs clients and in order to keep our low attorney fees of $945 (does not include credit report fee or court filing fee) for Colorado Springs clients, we do everything by phone, fax and/or email! If you don’t want to come to Denver to meet with attorney Nora Nye, give us a call on our Colorado Springs phone number: 719-497-9698 and we’ll set you up with a free 30 minute consultation with her. We have represented a large number of Colorado Springs clients and we can do the same for you! Give us a call and we’ll get you started on your way to a fresh start! By an Act of Congress and the President of the United States, the Law Office of N. Nora Nye, LLC is a federal Debt Relief Agency. We help people of Colorado to file for relief under the U.S. Bankruptcy Code..
Free financial and estate planning advice. Follow this link to visit our blog and get access to our advice! Estamos preparados para responder sus preguntas en su idioma.